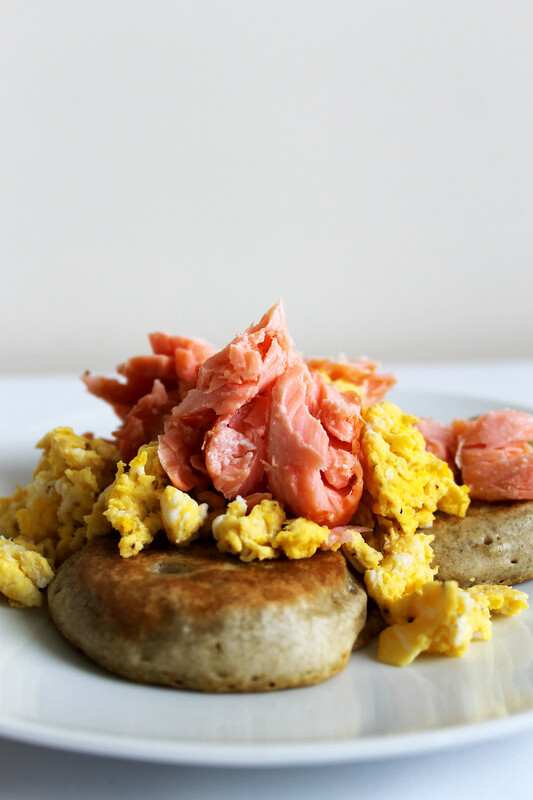 Smoked salmon and scrambled egg are a classic combination. 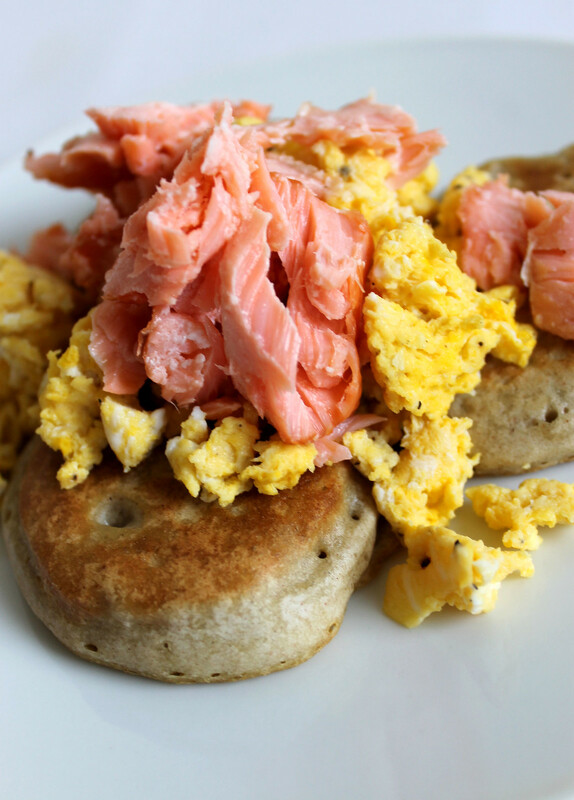 I’m a big fan of Irish smoked salmon and that would work really well here also but a couple of weeks ago I picked up some Norwegian hot smoked salmon in my local Lidl and it’s so tasty, I’ve been buying it since! It’s great served here with scrambled egg on these delicious buckwheat blinis. Also pretty tasty on the same blinis with cream cheese to serve for lunch or as finger food! I think Susan Jane White’s blog was the first I ever signed up for, way back in 2006. At the time blogging wasn’t really a thing but Susan Jane posted simple healthy recipes and I would love when a new mail popped into my inbox. In the meantime I became obsessed with food blogs and Susan Jane relaunched her site into the beautifully styled one that is there today. Check it out for some gorgeous healthy meals, I have made the chocolate beetroot cake a number of times and it’s always amazing! Serve with scrambled egg, poached egg and hollandaise, cream cheese, smoked salmon, bacon etc. You get the picture, these little buckwheat blinis are the perfect vessel to get all manner of foods in your gob. They are basically an alternative for toast. I make these as I do any other pancake type item. I put all of the ingredients in a bowl and if I’m feeling energetic I whisk them together by hand. If I am feeling on the lazy side I just whizz in the food processor for a couple of minutes. I’ve made them carefully, sieving the flour, whisking the milk and egg before adding to the dry ingredients etc. but there is no discernible difference in the outcome. It does make for a very short written method though, unless you waffle on with pointless drivel as I tend to do! Once your mixture is combined, heat some oil in a pan over a medium heat (extra virgin coconut oil is good as it has a higher smoking point than other oils), drop about a tablespoon of the mixture in for each blini. Cook on each side for 2-3 minutes until lightly browned. Top with the topping of your choice. This recipe will make about 10 blinis. You can keep them in an airtight container for a couple of days. They are perfect for popping in the toaster to reheat. I haven’t frozen them as they never last that long but I am sure they would be fine reheated in the toaster. P.S The Irish Coffee Council released the results of a survey they performed: What your coffee says about you. It’s definitely not saying the right thing about me! The Petite Kitchen is another favourite read of mine. How amazing do these zucchini chocolate cakes look? My blog is on the long list for the Irish Blog Awards! Check out the link for loads of other great Irish food blogs.